Yesterday I was out in the bitter cold wandering around NYC for 12 hours. Along the way I hit a couple sample sales, went penny hunting at the Rack and previewed the Rafe sale. I also lost my voice and now I'm a little sick which is why I passed out last night before I was able to get share my adventure. So let's start at the beginning. Met up with a shopping buddy at the Rack at 10am when they opened (nothing great), quickly grabbed a few cheap designer dresses and jumped the crosstown bus to head west to hit our first sale. After spotting a sample sale teaser on House of Harlow's Instagram I knew I needed to check it out. It's being hosted by In Support Of, which was around the corner from Dannijo so I arrived right before 11 when they were set to open. Waited till 10 after and they still hadn't opened so we left and went to Dannijo. When it's freezing out it's so not okay to open late. Headed to Dannijo and they graciously let me wait inside - which was so greatly appreciated. They even let us shop a little early. They told me no photos so all I can do is share my finds. Bags at this sale were $50-250 (last time they were all $75) with most at the $150 price point. Shoes were all $100 and they had a small collection of vintage clothing in tiny sizes - I spotted a cute Versace top for $75. Problem was that a lot of things were in the wrong bins. I understand that things can get mixed in along the way but being that I was first thru the door - they were clearly not arranged in the correct bins. I pulled a cute necklace out of the $25 bin - and was told at the front it was $150. It was very frustrating. Last time the cheap stuff was better laid out. Let's just say there was a lot of confusion at the register. I ended up buying much less because prices kept jumping at the register and I was so frustrated. For example, I pulled these cute waxed bracelets out of the $10 bin but when I got to the register was told they were $25. Initially I grabbed a bunch but edited down to just these two. The thing is that there were like 50 of them in the $10 box so it wasn't like someone dropped a couple in by mistake. I felt they should have honored that price but when you have the designer at the register, you really don't want to argue. The super cute Snyder sisters were hands on and working the sale - I actually fan-girled out a little and didn't chat with them as much as I would have liked to. Earrings were all jumbled in a box so you had to dig to find a mate. I mistakenly took one gold and one silver of the earrings on the left LOL. In my defense the lighting was dark in the space. I found another cute earring but I saw another shopper already had it in her bin so I gave it to her - and she didn't even say thank you. I should have held on to it and waited for her to give up and put hers back. These earrings were both $25 a pair. This bracelet popped up at the end. Initially I found one missing a couple stones in the $10 bin so I decided to be crafty and glue on my own stones. Then at the register I was told it was $25. I put it back and ended up finding this one and somehow it was also $25 - so I snapped it up. This is probably my favorite find from the sale. There was a ring bin that was marked $10 so I grabbed a few - and then was told they were $25 at the register so I ended up with just this one. It was a one day sale - which is why I gave you a heads up on Instagram and my blog the other day. Hopefully their next sale will be a little less confusing. I'm still happy with my small stash - and if whoever purchased the other earring mismatch wants to trade the gold or silver - LMK! For those of you who wanted to see what I wore in the freezing cold, here's yesterday's very warm #OOTD from head to toe. I actually sweat whenever I wear that fur because it's so warm and I always wear socks on top of my tights to keep my toes from falling off. A HUGE thank you to my friend A for snapping these pics! Across the street was this cool mural. We had to wait for a delivery guy to move his bike so we could shoot. I usually don't use so many pictures but I simply couldn't decide. Which is your favorite? Last but not least, a closeup of my penny Stuart Weitzman boots. After Dannijo and shooting, we headed back to the first sale (see full details here) and walked out after 5 minutes. Prices were steep and I didn't bother taking pics. The only House of Harlow stuff they had was some stock jewelry - the same pieces you see at Nordstrom Rack but prices were higher. They had samples from other designer designers but nothing cheap enough for me. My recommendation is to skip. We then went back to the Rack and met up with another shopping buddy and penny hunted until we all found something. I found the most, of course. 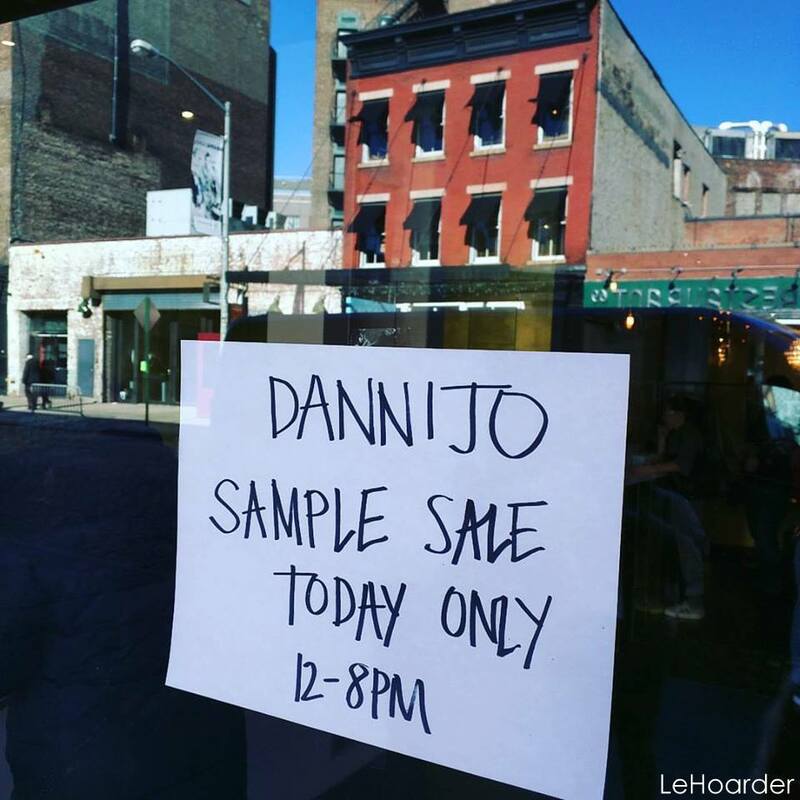 Finally, I hit the Rafe preview for their sample sale today! The designer, Rafe Totengco was on hand and I joined in on a tutorial on snapchat. It was worth going for that alone LOL. The sale was set up in a brow salon so they shaped my brows for me - again, so glad I went. Prices started at $25 for a simple pouch with a few pieces at $45. His more ornate clutches started at $95 and topped out at $295 for bags that retail for about $1000. They had lots of true samples and pieces that were not put into production. The display in the front had mostly $95 bags. I believe these were around $150. Of course everything I REALLY loved was $295 LOL. They didn't have the Love or Oui clutch I really wanted (they were sent out for press) so I found this beautiful blue snake clutch for $95 (the back is black) and was set to buy it until I spotted the gold (back is silver). I love all the texture. My new Mary Alice oval box clutch originally retailed for $398 but is now online at Bloomies for $278. Kicking myself for not having the designer sign it for me. 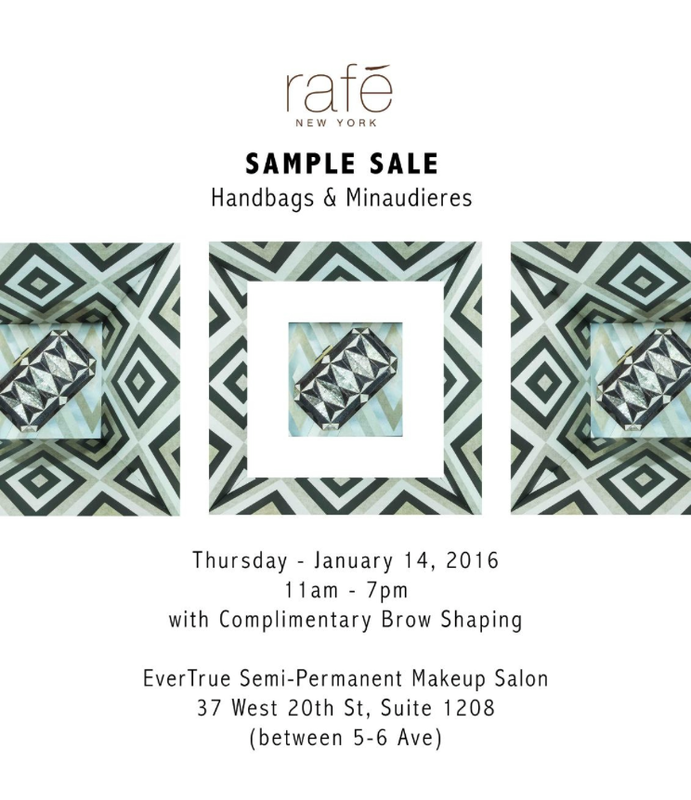 Rafe is a one day sale so head over today 11am-7pm for a bag and free brow shaping! That's all folks! I'm gonna take it easy today and recuperate from yesterday. Plus it's snowing out right now so I don't plan on straying too far from home. Although I got the Powerball yesterday so I doubled my money (that was the only number I hit) so I'll probably go pick up my whopping $4. You have four more days to enter my iMac and Kate Spade giveaway - you can do so here at the bottom of the post. If you're in the City make sure to stop by Rafe - let them know I sent you! First of all, you look great! I hate stores that get it wrong and don't make an effort to correct their mistakes! Thank you :) It was a little frustrating but I do appreciate that they do their own sale instead of farming it out and jacking up the prices. Love your Dannijo ring but lame that things were marked differently. The Chloe bag is looking goooooood on you my friend! Amazing that you can make a $1hat from h and m look so good!